Narendra Modi’s swearing-in ceremony is Live On DD Malayalam Channel. Its On Monday 26th May 2014 at 5.30 P.M Onwards. Pakistan Prime Minister Nawaz Sharif and Others Attending The Function. Rajinikanth, Amitabh Bachchan , Lata Mangeshkar, Salman Khan’s father Salim Khan are Some of Them Invited for the function. All The Doordarshan Channel Will Telecast The swearing-in ceremony of Modi and The Central Ministers. Prime Minister Sushil Koirala, Sri lankan President Mahinda Rajapakse etc Are Some of the Other people attends This Function. 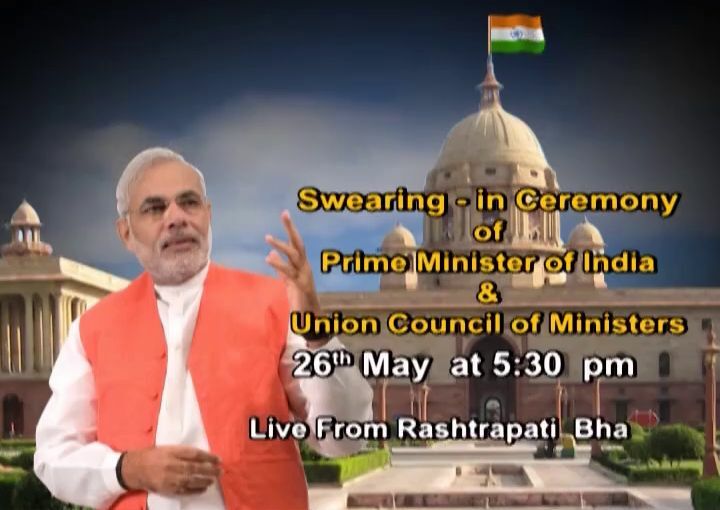 Narendra Modi swearing-in ceremony date is 26th May 2014 at 5.30 P.M Onwards. The event is Organized at the Rashtrapathi Bhavan Under Tight Security. BJP lead NDA Got the Majority to form The Government at Center. Home – Rajnath Singh, Finance- Subramanyam Swami, Foreign- Arun Jaitley, Defense- Sushma Swaraj, Railway- Vainkaiyaa Naidu, Urban Development- Nitin Gadkari, Agriculture- Gopinath Munde etc.